Big things are happening for Dallas' beloved Klyde Warren Park. 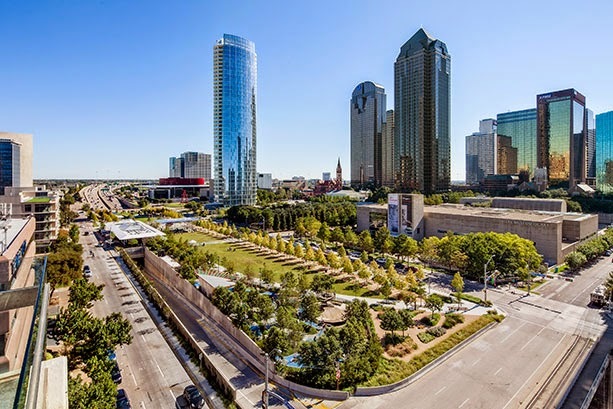 Museum Tower Dallas is pleased to announce that Klyde Warren Park, our neighboring five acres of perfectly manicured, public green space bridging the gap between Downtown and Uptown, has won the 2014 Urban Open Space Award. The prestigious, nationally-acclaimed Urban Open Space Award is presented by the Urban Land Institute and celebrates and promotes vibrant, successful urban open spaces that enrich and revitalize the surrounding community. Here in Dallas, Klyde Warren Park encourages all of us to stay active, be involved in the community and tightens the fabric of our city. So much life happens on that sprawling lawn in the heart of downtown Dallas. Here's to our friend and neighbor for bringing home this much deserved award! Museum Tower Dallas extends sincere congratulations. Enjoy a magical performance by Jackopierce and the Dallas Symphony Orchestra as the duo celebrates their 25th Anniversary. The show will begin promptly at 7:30 p.m.
Open Classical presents Night of the Living Dead Composers at 7:00 p.m. Experience the gorgeous fall weather and sounds of the season with this Halloween special featuring Decomposing Beethoven, Brahms and Mozart, plus a host of other colorful characters. Beginning at 8:00 p.m., visit the park as The Dallas Opera presents opening night of The Marriage of Figaro, simulcast live from the Winspear Opera House. Arrive earlier at 6:30 p.m. to participate in the spirited pre-show activities that include a screening of the 1945 Three Stooges classic "Micro-Phonies, a "Worst Bridesmaid's Dress Ever" contest, a bouquet toss and more. Enjoy a beautiful evening watching one of Mozart's most memorable comedic operas for free in Dallas' most vibrant outdoor space. This Saturday, October 25, stroll over to Klyde Warren Park to celebrate the park's second anniversary with a day of family fun. Festival activities will include face painting, crafts, fitness classes, dog training, a caricature artist, musical performances and more. You can also visit booths from neighbors and partners like The Crow Collection of Asian Art, Southwest Airlines and the Perot Museum of Nature and Science. For additional details, click here. Happy two years, Klyde Warren Park. We are so thankful to have such a beautiful space for life to happen here in Dallas.